Exciting Times Ahead – 2018! I did a similar post looking forward to the new year of 2017, so I thought I would follow the trend and do a 2018 one too! There’s so much I have already booked for the new year! If all goes to plan 2018 is measuring up to be one wonderful year!! Here’s what’s to come in the year ahead. Of the many events already filling up the new calendar are two concerts to see the Liverpool Philharmonic in action. Recently whilst in town, I walked past a billboard advertising the return of a short run of Khaled Hossieni’s The Kite Runner at the Liverpool Playhouse. After reading the book and missing the first run of this acclaimed play, I just had to book tickets this time around. Another much anticipated event happening in Liverpool in 2018 is the ticketed China’s First Emperor exhibition. Highlighting artifacts from the emperor’s spectacular tomb. 2018 is measuring up to be a fantastic year for street art trails. Here are just some of the Wild in Art trails I hope to visit. 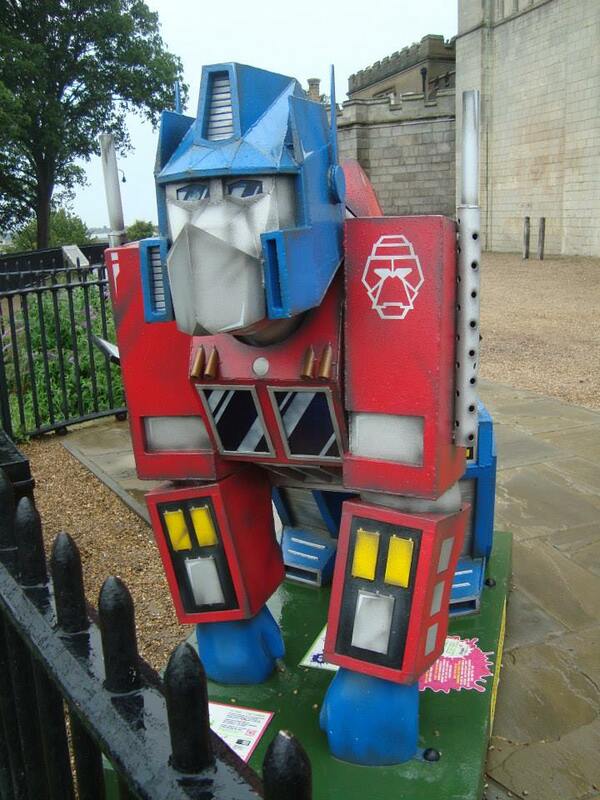 We have visited the lovely city of Norwich in the past, to see their gorillas and dragon trails. 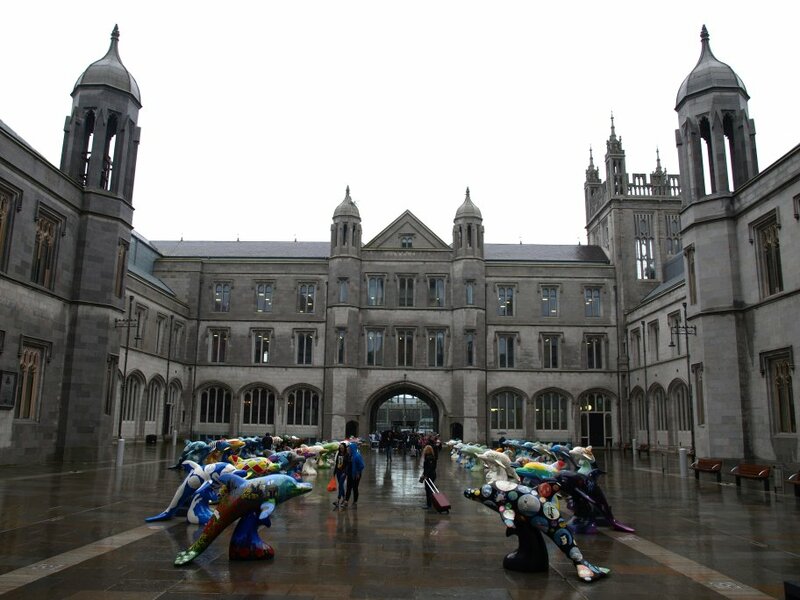 From the 24th June to the 8th September 2018, the city’s streets will be graced by colorful hares in their, GoGo Hares trail. Nottingham have an imaginative trail called Hoodwinked, this year. The sculptures in the shape of robins are an inspiring take on the Robin Hood name! I can’t wait to see them! Also, Manchester has a swarm of bees hitting the streets this summer in Bee in the City. These are just a few Wild in Art trails happening in 2018. Will you be going see any of them? 2018 is the centenary of the end of WW1. There will be forthcoming displays of Wave and Weeping Window by Paul Cummins and Tom Piper in the NW Region. The Weeping Window will be at Stoke on Trent’s Middleport Pottery in August/September and the Wave will be at Manchester’s Imperial War Museum September/November. Follow this link for more destinations in 2018. Will you be visiting any of them? As yet there are no holidays planned, but I do have some ideas. I just need to book time off work and to plan them! What events/holidays are you looking forward to in 2018? As I embark on the last week of The Wildlife Trust‘s 30 Days Wild, it becomes important more than ever, to continue to value and respect the wildlife that is around us. I find it difficult to enjoy nature while I am out and about going to work. However today I snapped a picture of a flower that was gracing the gates of my employment. 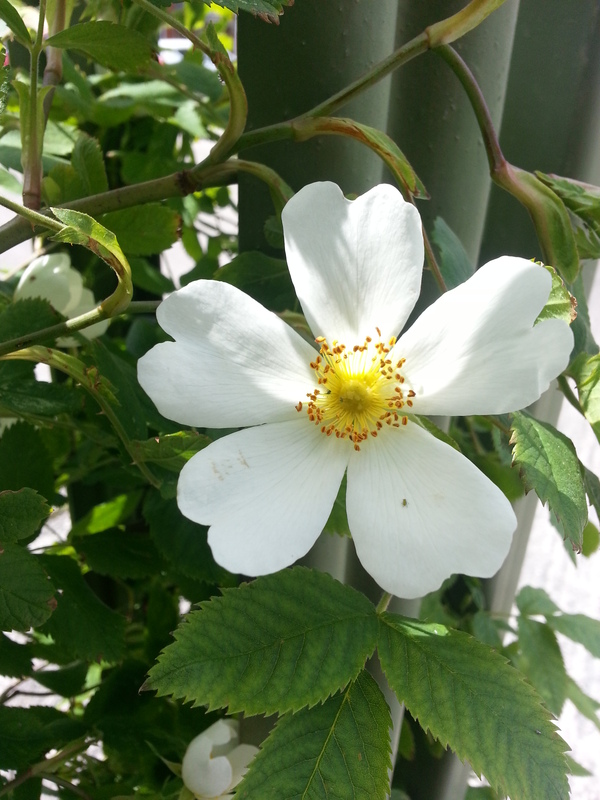 I did a quick Google search and found that it was a Rosa canina, or Dog Rose which is a deciduous shrub. 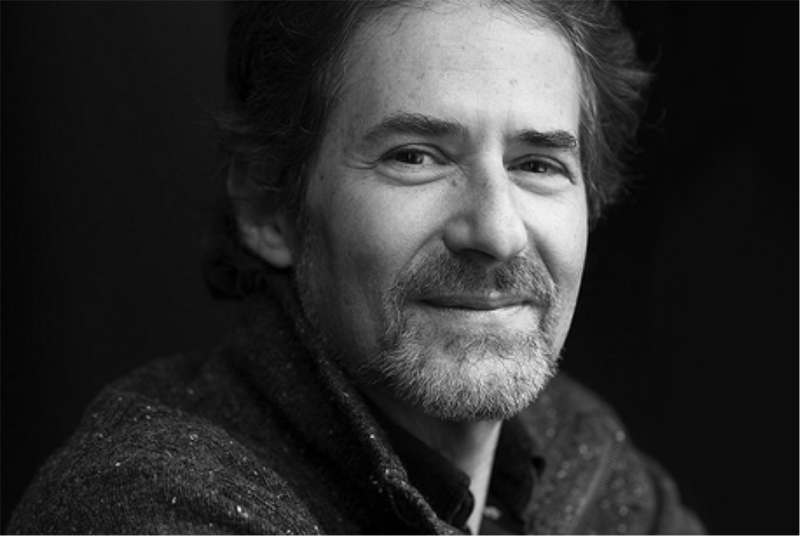 Though not nature orientated, I woke up this morning to the sad news that composer James Horner had died in an aeronautics accident. I admired Horner’s music well before Hans Zimmer’s. My first CD of his, was his stunning American Civil War soundtrack to the film Glory! The weather turned out to be half decent today. In the afternoon I managed to sit out and potter about my garden. The Passion Flower has grown ‘madly’ again and has hundreds (maybe an exaggeration) of buds on it! There are also purple flowers on the Hebe! I decided to follow a suggestion from the 101 ‘wild’ things to do which was to watch a nature webcam. Years ago I used to visit a websi from a farm in Yorkshire, called Marlfield. The website is called Lambwatch. (It’s best viewed on IE.) I checked it out today and found that they not only have one webcam pointed at a field, which during spring is filled with lambs, but have three others! One of which was a webcam in a Swallows nest. Knowing I love Swallows I spent a good hour watching the brood of about 4 growing baby Swallows. I wonder if the visiting Swallows near me will also be feeding a brood of similar size? I shall have to wait until they fledge, it was mind July last year! I shall keep my eyes towards the sky! Thursday was the beginning of our night away to Norwich to see the Go Go Dragons street art exhibition! Mum kindly looked after Artie while we were gone the night. It was not the first time we have gone on a hunt for dragons. The first was in 2010 in Newport! We set off on the M62 around 9am. I didn’t see much nature along the motorways, save for a few silhouettes of Buzzards and Kestrels hunting and along the A11 there was a field full of purple and white foxgloves! We got to Norwich by 1.30pm and spent the next two hours walking around the city streets. The weather was very humid and come the evening the sun shone through heavy laden clouds. We first visited Norwich two years ago when we popped in, on our way to Colchester, to see their Go Go Gorillas trail. 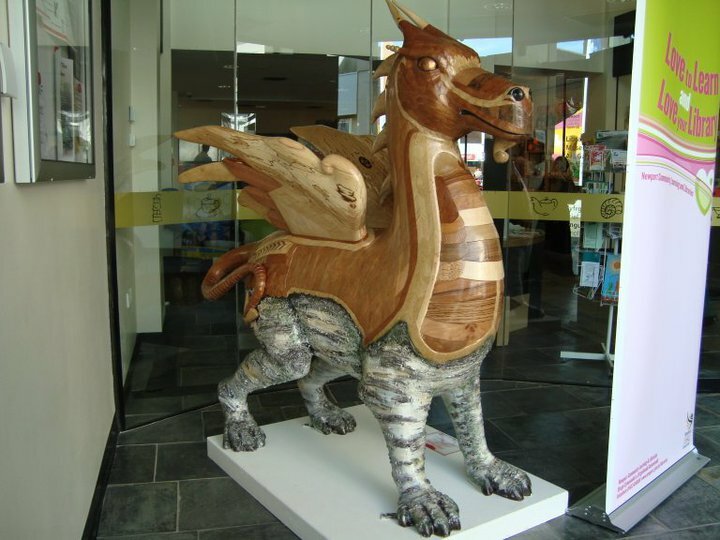 I was impressed by the artistic talent, so much so that come news that dragons were going to grace the city’s streets I had to pay them a visit! The dragons I think even surpassed the gorillas! Here are just a few from the first day! With tired feet we made our way to the B&B for the night. 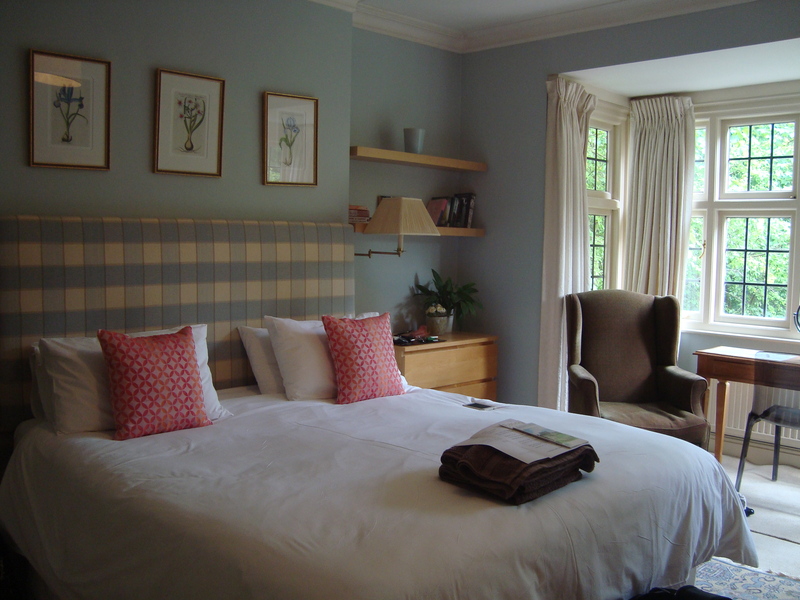 We stayed at the same B&B, 175 Newmarket Road, and incidentally the same room as two years ago! We had breakfast early on Friday so we could leave the B&B and head into Norwich before 9am! 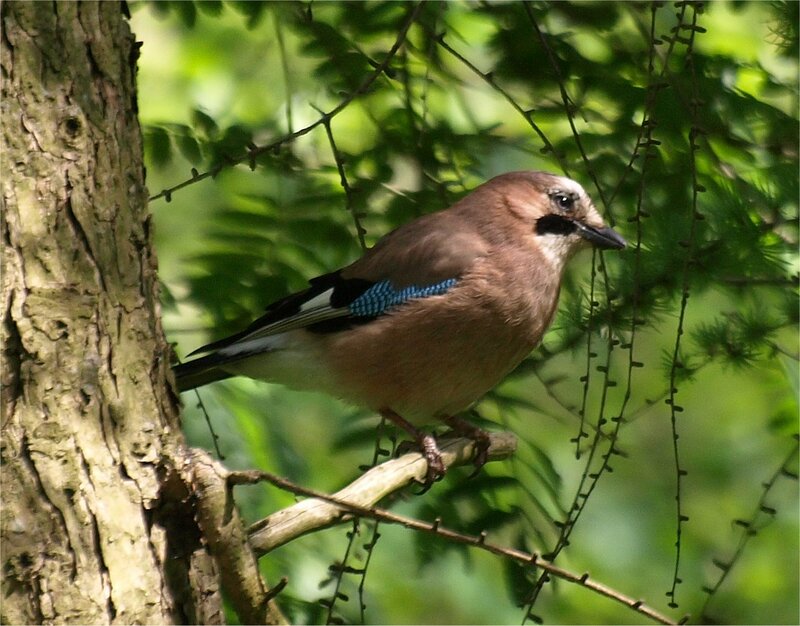 While we were packing I noticed a colourful Jay amongst the tree canopy around the house. It moved too quickly for me to get a picture so one of David’s taken on a day trip to Yorkshire Wildlife Park will have to do! I must comment that Norwich has fully embraced planting for wildlife and on most of their roundabouts and along the sides of dual carriageways there is an abundance of wild flowers! We spent the next four hours walking the city’s streets with map in hand! The positive of following a trail map is that you get to see parts of the city you wouldn’t necessarily see! There are some lovely churches and narrow tudor-esque streets in Norwich. However the north of the city is a bit derelict, like many towns. We found ourselves in a part of the city that was covered in graffiti! We did not feel safe! So we hurried back south towards the river. We saw 31 dragons on the Thursday and the Friday we saw a total of 32! So we saw 63 out of the 84 dragons on the streets, though we did see several more but could not take photos! Here are some of my favourite dragons from Friday’s hunt! Even though we never got to see the whole 84 dragons, I found following the trail map more satisfying than going to see them all in one place which we did last year when we went to Aberdeen to see ‘all’ the dolphins! After lunch at around 1.30pm we said goodbye to Norwich and set off on our journey home, and what a ‘long’ journey home it turned out to be! Instead of the 4.5 hours it should have took us, our journey lasted over 7 hours! Arriving home around 9pm! There was news of the M6 being shut around junction 16 and then the A14 was at a snails pace. There was nothing to do but to try and stay cheery, listen to the radio and try to keep hydrated and well fed. We took regular breaks. We tried to get the sat-nav to navigate around the blocked part of the M6 but it wanted us to go further afield into Wales, so we decided to see what was in store for us on the motorway! We paid the £5.50 to go on the M6 toll and the first junction was at a stand still. I thought that it was a waste of money but once we past the first junction it was smooth travelling until the M6 toll merged into the M6. Then the travelling was in fits and starts, so much so that I got a migraine with the stress. I thought we would never get home and my phone decided to die! We stopped off at Keele Services and had a fast food dinner! It was not what I had planned. I had planned something more healthy, after the curry the night before, but there was nothing to be done. So a Burger King it was. I had a vegi wrap while David had a chicken sandwich and chips. I also had a Costa coffee which, with the Zomig I had taken, helped ease the migraine! For the next two hours, though fuelled, we continued on our slow journey home. To break the monotony David said I should take some pictures of the Cheshire countryside. On our arrival home, we were welcomed by a familiar sight. 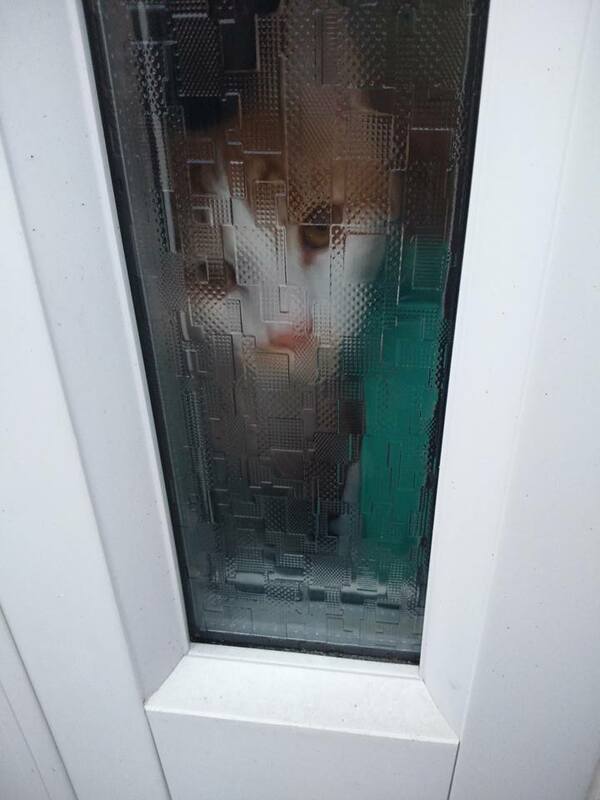 Artie looking out of the window at us! 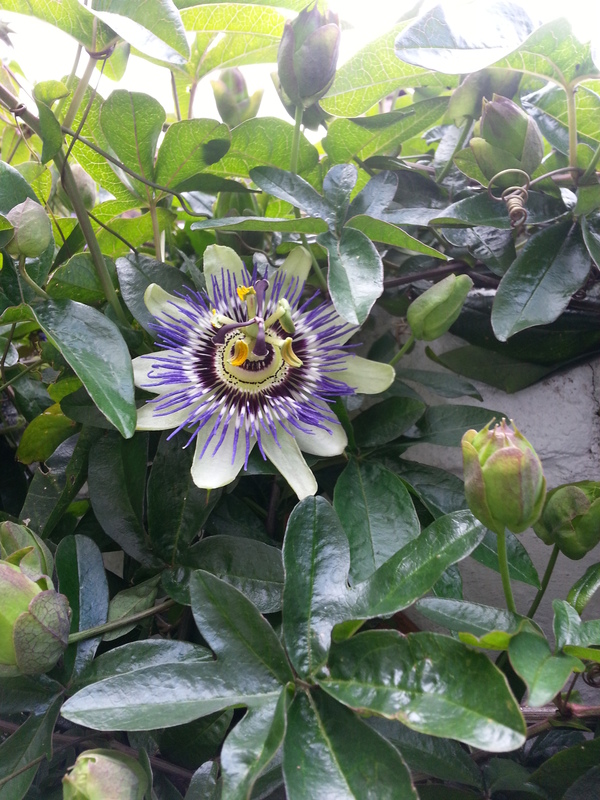 Back home to ‘normality!’ I found that the Passion Flower had started to bloom! There was one sitting proud for all to see! I look forward to many more budding! For Saturday’s dinner I made a healthy Roasted Pepper and Bean soup. 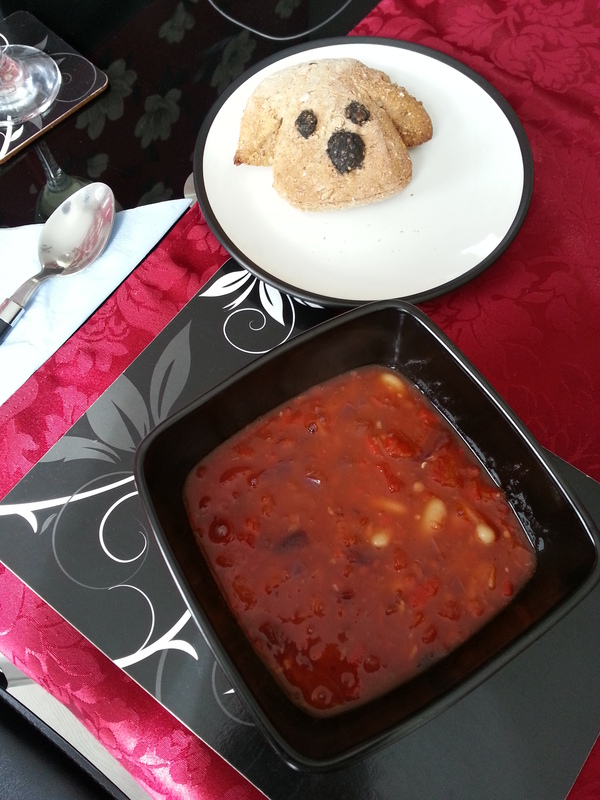 I served the soup with Wholemeal granary bread that I had made and David had shaped into dogs! I spent today’s lunch with our finches. We let them fly around the living room at weekends. 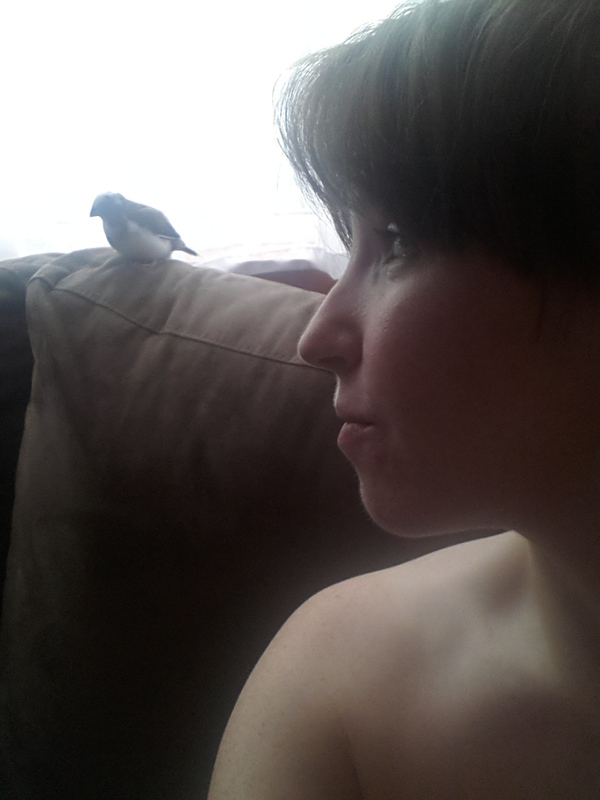 Here’s a selfie I took with Chocolate our Bengalese Finch, she was getting very close to me! I think I am going to have to attempt to separate the Borage seedlings either today or sometime during next week! Look how much they have grown in a month! There are only two more day’s of June and 30 Days Wild, but I will continue to admire the nature that is around me in the coming weeks/months. 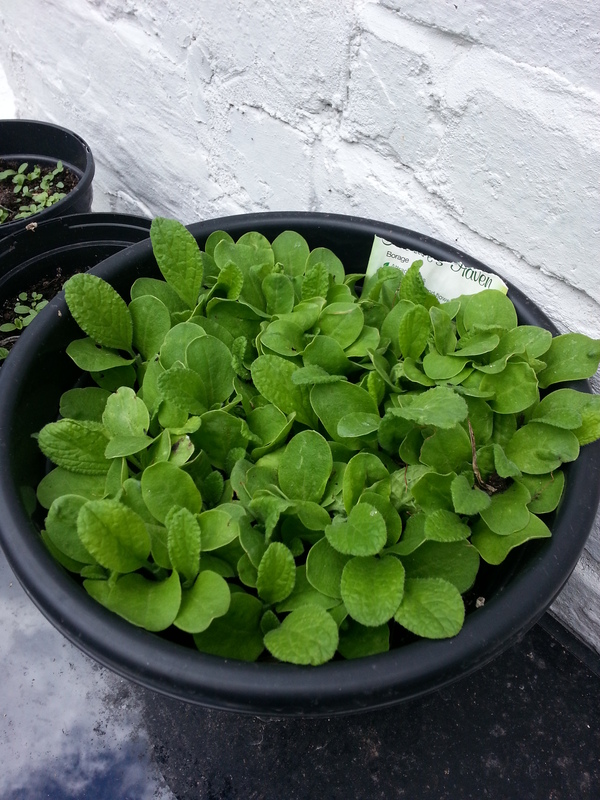 Will the Borage and Teasel seedlings bloom? How many Passion Flowers will I get? Will I see any fledgling Swallows? Only time will tell!